both of you are idiots and can't understand the numbers, let alone the politics involved in each of these 2 races - [i]"Democrats remain in the minority in both the Oklahoma and New Hampshire Houses of Representatives"[/quote]....good luck with the other 998 seats that Democrats have lost over the course of the past 8 years. But yeah, hold on to that whole "maybe its a sign" mental deficit of yours. both of you are idiots and can't understand the numbers, let alone the politics involved in each of these 2 races - "Democrats remain in the minority in both the Oklahoma and New Hampshire Houses of Representatives"....good luck with the other 998 seats that Democrats have lost over the course of the past 8 years. But yeah, hold on to that whole "maybe its a sign" mental deficit of yours. Of the 30+ special elections held since the presidential election, Democrats are averaging a +12-17 edge over their recent natural lean depending on which analysis you buy. It's as large of an edge as has been measured and would be in line with a landslide victory in 2018. They're winning seats they have no business winning. At the same time, Trump's approvals are low despite inheriting solid economic conditions, Democrats dominate generic ballot polling, and Republican legislators are currently retiring at an elevated pace. All this bodes well for Democrats. It's what you'd want to see if you were hoping for a substantial Dem victory in '18. What you can say is that 2018 is still so far away that this trend could collapse. The election is still a political lifetime away. Trump being as unpopular as he is with the state of the economy and no unpopular war is highly unusual. It's not unreasonable to expect a reversion to the mean at some point. If Trump were a normal politician, he'd be quite popular right now, and if it were election time, he should be cruising to a landslide as an incumbent. All due to good luck. The fact that this isn't the case is a testament to how awful things are and to the extent which that has sunk in with the American public. Your asinine "Republicans rule! Everything Democrats think or do is the wrong decision! I have no understanding whatsoever of political cycles!" is not shedding light on anything besides who you are, though. Apart from the idiocy of dismissing the qualifying "special elections", there is no sensible person that could, or would, try to infer this statistic as being "in line with a landslide victory". A landslide is losing 1000 seats in 8 years, with very few "special elections"...your statistic addresses a negligible percentage at this point. All this bodes well for Democrats. No, it doesn't, because it is insignificant to the political landscape....it is a textbook example of you and KG "wishful thinking"...you need to seriously understand the difference...at least KG noted "hopefully" in the OP. It's what you'd want to see if you were hoping for a substantial Dem victory in '18. Nope, its what you would want to spin in various OP-Eds if you wanted keep your base "hopeful". What you can say is that 2018 is still so far away that this trend could collapse. Dude, it is not a trend...do the math. The election is still a political lifetime away. Trump being as unpopular as he is with the state of the economy and no unpopular war is highly unusual. It's not unreasonable to expect a reversion to the mean at some point. If Trump were a normal politician, he'd be quite popular right now, and if it were election time, he should be cruising to a landslide as an incumbent. All due to good luck. The fact that this isn't the case is a testament to how awful things are and to the extent which that has sunk in with the American public. Trump has not been a major factor in these "special elections" - get yourself better information; try facts first then punditry. 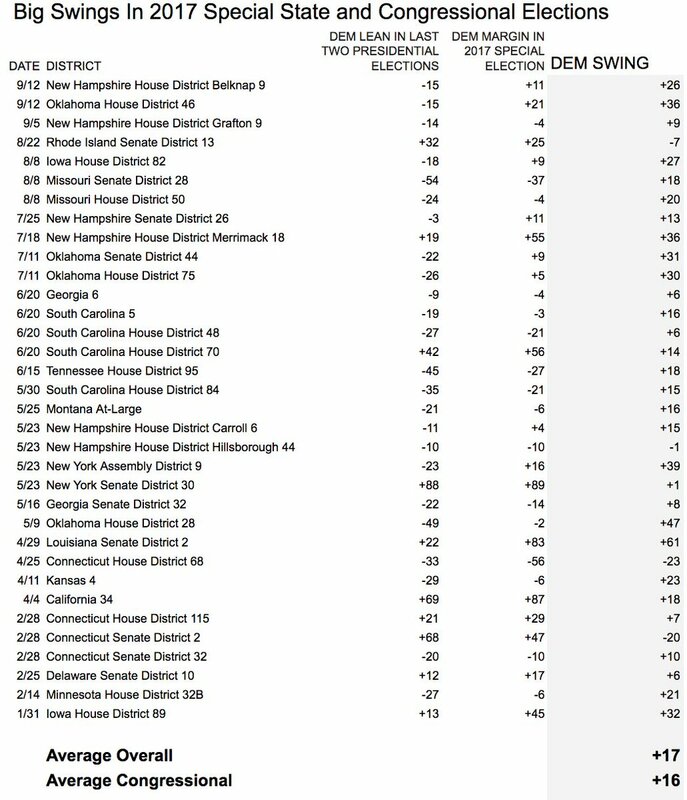 Not asinine, but factual - 1000 lost seats due to wrong decisions; embarrassing political defeat in Nov 2016 due to wrong decisions; and consistently dismal election performance at all levels due to wrong decisions - all this is seemingly what you understand but yet still deny because "Democrats are cool!" - and that, my friend, is asinine. 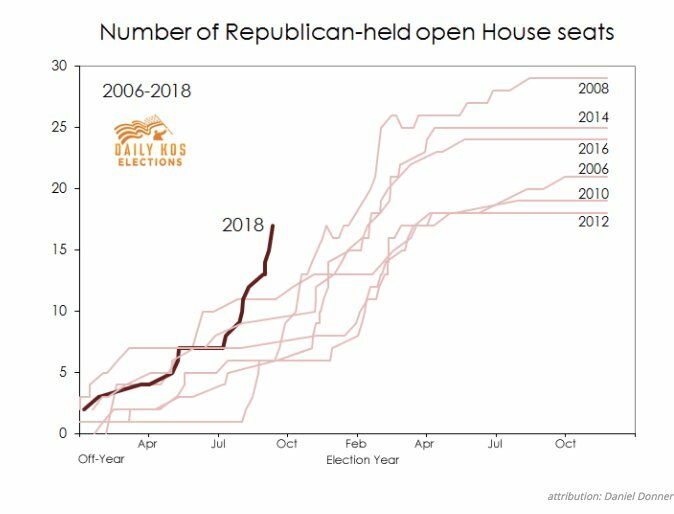 Special Election outcomes are usually predictive of mid-term election results. The correlation between the two is traditionally strong and Democrats are vastly outperforming their baseline in special elections. I'm being overly cautious this time around because Trump's popularity numbers are so unusual relative to the fundamentals. Presidential incumbent popularity is the most important factor for national two-party sentiment. My facts are coming from sources like Harry Enten and Nate Cohn. You're just naysaying without providing any substance. Look, we know that your position is that Republicans are doing awesome no matter what and when you get to be the lucky broken clock every so often, you'll crow. Democrats lost a ton of seats during Obama's presidency mostly because they inherited a bad recession whose awful effects lingered into 2010. You can try to make it about your political preferences, but no factor is as significant as that one. These are all factors, all aligning in the exact same direction, that traditionally predict election outcome well. The closer you get to the actual election, the better they are. As I said, 2018 is far enough away that I wouldn't hang your hat on anything yet. There's plenty of time for large swings in public opinion. But if you wanted to see a Dem victory, these are the kind of numbers you'd be hoping for as they traditionally bode well. So basically what you're saying is subgenius is stupid. It breaks all the states' legislatures down, with the exception of Nebraska.